Delicate Design Single Strap Backpack: Stress bearable mechanics design fits most people’s body well, and allows the waist to distribute the press on the back effectively. The adjustable strap is comfortable across your shoulder, which can keep right place across your body all the time instead of moving over to your neck or to the front side. 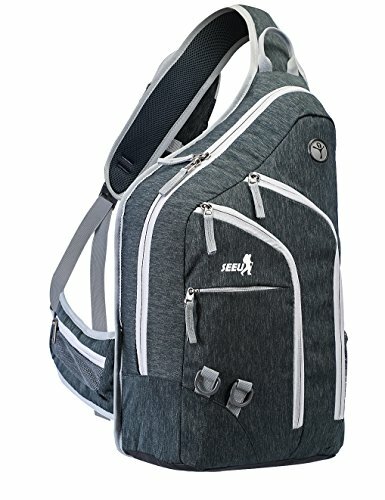 SEEU Big multi-functional one shoulder sling backpack with 28L Capacity! An ideal backpack for traveling, working, shopping, daily outing! 1. Big Capacity for wide usage: Perfect crossbody bag for men & women to carry on school, travel, business trip, work commute, shopping and daily outing etc, also a good choice as outdoor sports bag(hiking, fishing, camping, climbing, cycling, riding etc), big enough to take everywhere. 2. Fantastic Design：Unisex Stylish mechanics design can perfectly allow people in any age to pack comfortably. SEEU – “see around the world with you is founded in 2010, a manufacturer of sport gear all over the world, designs feature-rich outdoor gear with more innovative elements to stand out in the market, have provided a total of 80 million quality products to consumers, aims to make your life more easy with seeu products. Any problem, please kindly email us first, we promise to reply you within 24 hours and solve any problem for you as a honest seller. SEEU SPORT provide 1 month 100% satisfaction, Money Back & Replacement Guaranteed. Love these types of bag just jump on motorcycle on your off on great ride,good price,well made ,nice color. Nice looking bag at an excellent price! !